I have been on an Asian kick recently. One of the best Vietnamese restaurants in Cleveland, in my opinion, is Minh Ahn. It is located on Detroit Road just on the outskirts of Gordon Square in what is called “Little Saigon.” It looks like a hole in the wall in the middle of what suburbanites might feel is fairly sketchy neighborhood. It is actually fairly safe, and they have an enclosed parking lot that sees a fair amount of traffic. 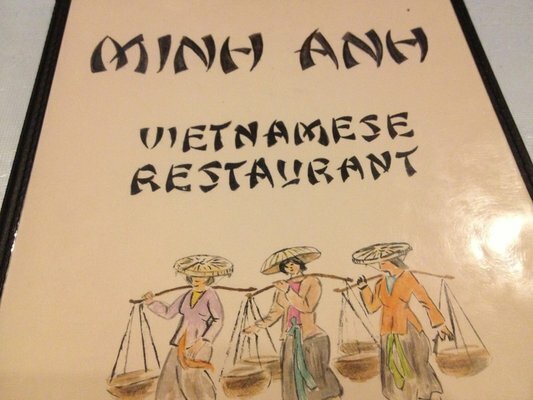 Minh Anh is a family-run restaurant that has been in business since 1984. Everything is very fresh, because there is a Vietnamese market on the other side of the parking lot. They don’t concentrate on aesthe tics. The Muzak is horrendous, the place is fairly bare and dated with a fish tank, wood walls and plastic tablecloths under glass, and the website is pretty outdated. However, the place is very clean, and the food is delicious! The pho is the best in town in my humble opinion. I LOVE their cinnamon beef pho. The broth is rich and full of flavor, and the burst of cinnamon really brings it to the next level, surpassing the other pho joints in town. The noodles are always cooked perfectly, with a decent amount of meats. I chose the #22 (Phở tái Chin with well done and rare beef & beef balls) this time around. I can take or leave the beef balls, but love the thinly sliced beef. Limes are getting expensive, so the condiments they serve are jalapenos, bean sprouts, and a slice of lemon. If you prefer lime I suggest you bring your own with you. The Thai basil already comes in the broth (and a generous serving at that), and you can clearly see in the photo that the leaves were fresh and not wilted. My waitress asked why I wasn’t using the chili paste/oil (I am not a fan of spicy), but she showed me how to doctor it up by mixing it with the hoisin sauce and chili sauce in the bottles on the table. About one third of each sauce mixed together in the bowl to taste, and it is not at all spicy and just delicious! I greedily added it to my pho. I ordered a small pho and two egg rolls, and it was the perfect meal. The egg rolls and spring rolls here are also always a delight. This time around I was so hungry that I dug into the egg rolls without taking a picture. They came out of the oven piping hot. In fact, I burned my tongue on them a bit. I cut them up to let them cool down a bit, and the pork, cabbage and carrot filling was dense and flavorful while paired with the crispy, flaky wrapper. The fresh Shrimp Spring Roll (#9 – Gỏi Cuốn) is served with a side of peanut sauce for dipping. The roll is always fresh and tasty, and peanut dipping sauce is thick, creamy and delicious! One of my other favorites here is the Deluxe Pad Thai (#99a). First of all, it is a beautiful, vibrant color (look at the vibrant red cabbage in the photo!) and chock full of everything that makes Pad Thai delicious – fresh rice noodles, shrimp, pork & chicken, bean sprouts and peanuts – and pickled red cabbage. The Egg Rolls with Vermicelli (#50 – Bún Chả giò) is wonderful. 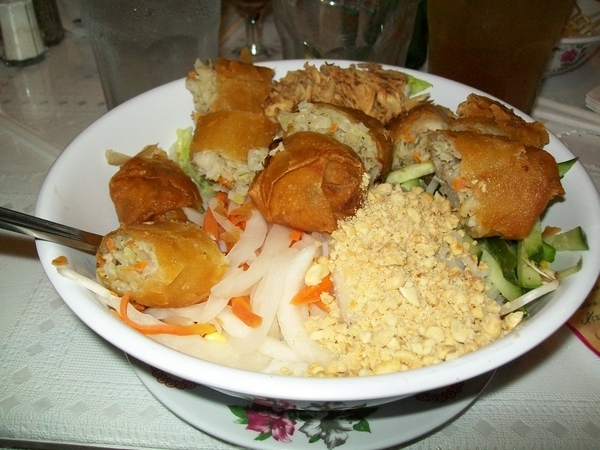 It features a huge bowl of noodles, egg rolls, pickled carrots and cabbage, cucumber, bean sprouts, onions, spicy ground peanuts and tiny fried onions. Next time I am ordering the grilled pork (#53 – Bún thịt nướng) – and order egg rolls on the side to enjoy the best of both worlds. Minh Ahn is a dependable, affordable, and friendly place to eat. I’ve been here by myself numerous times as well as one time with a fairly large group of dining out enthusiasts, and not a single person complained about their meal. We all shared, and although we had a variety of dis hes ranging from Bun dishes, Vegetarian Szechuan (pictured), Scallop Hibachi, Vietnamese Stir Fried Noodles, and numerous curry dishes the hands down favorite was the cinnamon beef pho! If you want some flavorful Vietnamese cuisine you won’t go wrong here! Just be sure to wear a shirt that you can clean. I left after my most recent visit wearing quite a bit of pho broth! Minh Anh is such a gem. My favorite pho in the city, for sure. I also love the shrimp spring rolls. That peanut sauce is wonderful.